Our Fascia and Soffit Cleaning really helps to Improve the look of your UPVC Fascia and Soffits. Regular cleaning reduces the build up of dirt and eliminates the risk of permanent staining. We use only environmentally friendly cleaning products, Our high reach water fed pole system enables us to clean sofitts and fasciass from the safety of the ground, we can also reach over extensions and conservatories with this system. Note: No pressure washer is used. 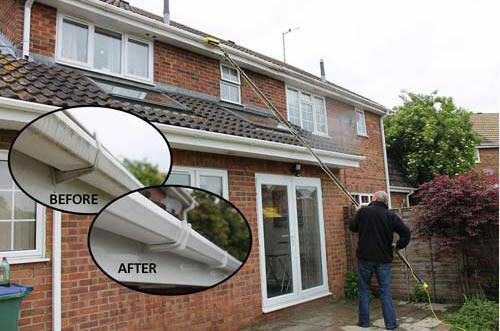 We also offer a full Fascias and Gutter repair and replacement service. Have you got a misted/condensation between your double glazed unit? We can replace this! we offer a very competitive prices. Damaged UPVC? We can repairs holes chips etc in any of your UPVc products ,we use special a special wax and paint system to make repairs these are almost invisible to the naked eye, perfect if you are wanting to move house and want the best possible price. we can source and repair most from our extensive network of suppliers. Want a secure feeling that only you can gain access? KEYED A LIKE BARRELS FOR YOU. Call: 07827 258782 or use our quick online enquiry form.